The Aggies and the Cougars meet on national TV on Friday night in the second most important in-state contest for each team. That’s not saying much since there are only three FBS teams in Utah, but the stakes are still high here. Both of these teams already have two losses, so neither can really afford another if they want to keep hopes of a decent bowl berth and a solid season alive. The Cougars are going to be out for revenge in this one. Last year the Aggies won, 31-16, at home to break a 16-year winning streak for the Cougars. BYU isn’t used to being the second best in this series, so they will be looking to correct that. Utah State players and fans always feel neglected in a state crazy about the Cougars and Utes, so a win in Provo -- something they last earned in 1978 -- would help to get them some attention and respect. BYU’s time as an independent may not last long if the Big 12 reaches out to them (which they should), but until that happens every game is important. It will be harder for them to get national TV coverage if they are playing poorly, so they really need to start looking like a dominant team and not an ordinary one. As is often the case in college football games, quarterback play is going to be an issue in this one. Both teams would like to be further ahead than they are at the QB situation. BYU’s Jake Heaps showed a lot of promise as a freshman last year, but he has taken a big step backwards so far in his sophomore season. His yards per attempt are a lousy 5.34 and he has just three touchdowns against five interceptions. He isn’t showing a lot of progress, either. The Aggies play solid defense — 12th overall in total yards — and they can be aggressive, so they could easily give Heaps headaches. Utah State counters with true freshman Chuckie Keeton. Former starter Diondre Borel was disappointing as a senior last year, so the pressure was reasonably low for Keeton. It has only been three games, and the team is being careful with him, but early results have certainly been encouraging. He has completed two-thirds of his passes, has passed for two scores and run for three more, and has yet to be picked off. As unlikely as it would have seemed at the start of the year USU is far more likely to get strong QB play than BYU. The running game will also be a big story here. The Aggies are very solid on the ground. At 316 yards per game rushing they rank fifth in the country. They have a four-headed attack — Keeton can run, and they have three running backs led by the impressive Robert Turbin (365 yards and eight touchdowns in three games), who can do some damage. The BYU run defense is just average, so the Aggies have a potential to exert themselves here. The Cougars, on the other hand, are not a threat to run at all. They are 116th in the country in rushing and are facing a USU team that has allowed only 82.7 yards per game. BYU’s anemic offense has been a big issue all year, and the pressure on Heaps and his arm will be higher than ever in this one. The last game is one to focus on for both teams. BYU beat a solid Central Florida team at home, though the Knights seemed to be suffering from a hangover after their frustrating loss to FIU the week before. That’s a win that the team can build on, and it distances them from the horrific loss to Utah. Utah State needs to make sure that they don’t let a lousy loss last week against Colorado State drag them down this week. The game went into double overtime. and the Rams scored first. When Utah State scored a TD of their own they gambled with a two-point conversion to end the game instead of going into another OT period, but the run failed and they lost. The line opened with BYU favored by 9, according to college football odds, but has quickly fallen. It is now widely available at the key number of seven, and can even be found on the other side of that number at 6.5. The number of bets have been evenly split between the two teams, so that’s a clear sign that the smart money is heavily on the Aggies. The total opened at 50.5 and is stable in early action. The home team is 6-1-1 ATS in the last eight meetings between these squads. Utah State is 8-3 ATS in their last 11 games played on grass. 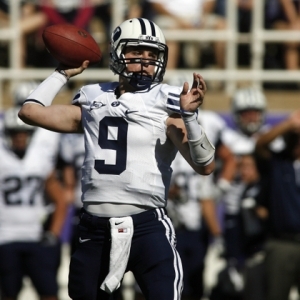 BYU is just 5-15-1 ATS in their last 21 against the WAC, but they are 7-2 ATS in their last nine games overall. I find it hard to like the Cougars in this one. Their offense is pathetic, and their defense is underwhelming. They are young and lacking in experience — though their win over Central Florida last week was reasonably impressive in some regards. They have played better competition, and on paper they are the better team. However, something just isn’t right with them. The Aggies hold an edge on the ground, and showed that they are tough when they almost won at Auburn on the opening weekend. BYU is getting more credit than their offense deserves right now, and at a spread of a touchdown the Aggies are the more attractive option here.